I’ve said it before and I’ll say it again, I’m a planner. 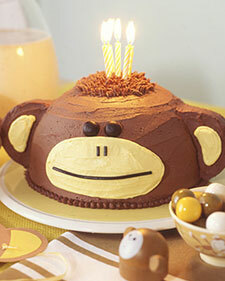 P’s 2nd birthday party is next month and I’ve started gathering ideas and recipes. I have very specific things in mind for parties. I get a theme in my head and then I want it executed to perfection. I’ve now found the best thing is to go slow and steady so the day of I can relax. This year….this is a hush theme so don’t tell P! This year we’re going to do a monkey theme. Her favorite animals right now are monkeys, chickens and cows. She’s going to be a chicken for Halloween and I found great monkey decorations for a 2nd birthday party so we’re going with that. We have so many kids in our neighborhood but they are all at least 3 years older, except for one little girl. I hate excluding everyone but I can’t handle a party for a wide range of kid’s ages and I want to focus on P. So, I have to keep it small and with guests she’ll enjoy. We’re inviting 7 kids all between 2.5 and 1.5. Including P it’ll be 4 boys and 4 girls. P has more guy friends…I love it btw. I found an online party place that does themed packages. Although I hate doing stuff like this, I’d rather design my own, this place had a “mod monkey” theme I loved. Everything was included: invites, plates, napkins, cups, table cloth, utensils, streamers, center piece, balloons, party favors and candles. All with monkey or 2 on it. So, why not. I can focus on other parts. I’m not a fan of kid birthday parties because the food is usually cheap and all kid focused. Hubby is going to order the adult food at a local great Greek market. It’s one of our favorite places. I’m going to make the cake(just found a design and recipe) and the kid’s food from Deceptively Delicious. I believe in good food, especially for the kids and especially for tired parents. P’s bday falls on a Friday. So, we’ll do it on a Saturday. It’s all working out perfect so far…..
PS. I just found out there’s another book whose author had the original idea behind hiding veggies in food, The Sneaky Chef! Will have to check this one out to!